When people find out I ski, do triathlons, and a host of other outdoor stuff, they say, “Wow, you’re so athletic. I wish I could do that.” Here’s my deep down dark secret, I’m not athletic at all. When I hit my first steep turn mountain biking, I panicked, slammed on my brakes and tipped over. It took two months for me to get up on water skis. 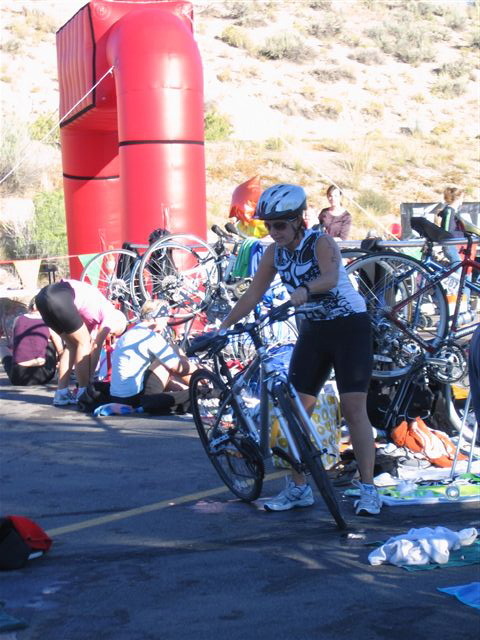 My triathlon swims usually end with me belching my way through the bike ride because of all the water I swallowed. The first season I skied, I was the only one in class who could tip over standing still. Here’s a little something I learned about becoming athletic. My first tri. The helmet in the bottom left is my neighbors. I managed to kick it a good ten feet while I was trying to get my own stuff on. Embrace Looking Stupid: Sometimes we as adults aren’t willing to look stupid or silly. We hold on much too tightly to our dignity. I can’t go the gym, we think, all the in-shape people will judge me. I’ll look dumb doing that race at a walk. Five-year-olds will pass me skiing. So what, dignity is overrated. I powered down the hill in a huge wedge my first ski season as every stupid little kid shot by me. I resisted the urge to trip them with my pole and now I pass them, ha. Embrace Falling: When I went paddleboarding for the first time, I was nervous about falling. Totally ridiculous as I was four inches above the water. I finally fell on purpose to get the worry out of my mind. The first thought I had when I fell biking with clip-in pedals was, wow, that didn’t hurt as much as I thought it would. Falling (or messing up) is inevitable so get it out of the way first and you can enjoy your experience. Embrace Risk: Fear of injury is a valid concern. I fully expect one day my knees will have to be rebuilt (already have one new ACL, which I blew out getting off a lift) but I’ve accepted this as the price I pay. However, usually when I meet people with injuries, they’ve acquired them doing something stupid (see above): taking out the garbage, running between rides at Lagoon, heck, I’ve fallen harder at work on three steps than any ski slope. Injuries may happen but being athletic actually makes them less likely in your day-to-day life. And if you do get injured, better to be doing something cool and have a story to tell then having to say you fell off the toilet. Last year at the age of sixty, my mom learned to ski. She’s done it a few times over the years but never really picked it up. Her first day, she wore herself out on the conveyor belts before we even got on a lift. When she took off her helmet at lunch, her hair was matted with sweat and she had a total ski head. I’ve never been prouder. The first time I took her on a large hill, she had an awkward cartwheel fall and managed to give herself a black eye with her eye glasses. I thought she might give up, but she just bought contacts. She usually hates the cold but last year she cussed the warm March temps for melting the snow. I told her she was officially a skier. You don’t have to be naturally gifted or talented to do something new. You just have to want to do it. I was only 58 at the time. This is so absolutely true! I was the slow, chunky kid growing up and after a couple years of coming back to my outdoor adventure roots, I’m finding muscles I never thought I’d have. You know what’s funny is that a lot of the naturally athletic people have let their talents go because they never had to work for it. As a fellow slow, chunky kid, I never expected it to be easy. Totally. I’ve watched so many “star athletes” from high school let themselves go over the years (and, seriously, no judgment, life gets us all in different ways), but not having ever had it easy, I never just assumed I would stay fit.